For the Japanese rock band, see Good Morning America (band). The program features news, interviews, weather forecasts, special-interest stories, and feature segments such as "Pop News" (featuring pop culture and entertainment news, and viral videos), the "GMA Heat Index" (featuring a mix of entertainment, lifestyle and human-interest stories) and "Play of the Day" (featuring a selected viral video or television program clip). It is produced by ABC News and broadcasts from the Times Square Studios in New York City's Times Square district. The primary anchors are Robin Roberts, George Stephanopoulos, Lara Spencer and Michael Strahan along with newsreader Amy Robach and weather anchor Ginger Zee. Good Morning America has been the most watched morning show in total viewers and key demos each year since Summer 2012. GMA generally placed second in the ratings, behind NBC's Today from 1995 to 2012. It overtook its rival for a period from the early to mid-1980s with anchors David Hartman and Joan Lunden, from the late 1980s to the mid-1990s with Charles Gibson and Lunden, and in April 2012 with Roberts and Stephanopoulos. On January 6, 1975, ABC launched AM America in an attempt to compete with NBC's Today. The program was hosted by Bill Beutel and Stephanie Edwards, with Peter Jennings and Robert Kennedy reading the news. Because the show could not find an audience against Today (and its anchor team of Jim Hartz and Barbara Walters), ABC sought a new approach. The network found that one of its affiliates, WEWS in Cleveland, Ohio, had been pre-empting AM America in favor of airing a locally produced show called The Morning Exchange. Unlike AM America and Today, The Morning Exchange featured an easygoing and less dramatic approach by offering news and weather updates only at the top and bottom of every hour and used the rest of the time to discuss general-interest/entertainment topics. The Morning Exchange also established a group of regular guests who were experts in certain fields, including health, entertainment, consumer affairs and travel. Also unlike both the NBC and ABC shows, The Morning Exchange was not broadcast from a newsroom set but instead one that resembled a suburban living room. In the process of screening the Cleveland morning program as a creative source, ABC also began looking at another local show, Good Morning!, which was produced by Boston ABC affiliate WCVB-TV. Good Morning! was very similar in format to The Morning Exchange, but with a lesser emphasis on news and weather. In fact, once the revamped ABC morning show took to the air late in 1975 under the title Good Morning America, WCVB station manager Bob Bennett accused ABC entertainment president Fred Silverman of deliberately stealing the title of Good Morning! ; no legal cease and desist action was finalized against ABC in the matter, however. The launch of Good Morning America did result in the Boston morning show changing its name—to Good Day!. ABC took an episode of The Morning Exchange and used it as a pilot episode. After very positive reviews for the pilot, the format replaced AM America in November 1975 as Good Morning America. The first host of the new program was David Hartman, featuring Nancy Dussault as his co-host. Dussault was replaced in 1977 by Sandy Hill. For the first seven years, weather forecasts were presented by John Coleman, former chief meteorologist for ABC owned-and-operated station WLS-TV in Chicago, who would leave GMA in 1982 to start The Weather Channel with Landmark Communications CEO Frank Batten. Dave Murray (now chief meteorologist at KTVI in St. Louis) provided the forecasts for both Good Morning America and ABC's early morning news program ABC News This Morning from 1983 to 1986. In August 1986, he was replaced by Spencer Christian, who worked at WABC-TV in New York City and served as fill-in meteorologist for both Coleman and Murray whenever they were away on vacation or assignment. The program's ratings climbed slowly, but steadily throughout the 1970s and into the 1980s while Today experienced a slight slump in viewership, especially with Walters' decision to leave NBC for a job at ABC News. On August 30, 1976, Tom Brokaw began anchoring Today while the program began a search for a female co-host. Within a year, Today managed to beat back the Good Morning America ratings threat with Brokaw and new co-host Jane Pauley, featuring art and entertainment contributor Gene Shalit. Good Morning America continued to threaten Today's ratings dominance into the 1980s, especially after Brokaw left the latter program to become co-anchor of NBC Nightly News with Roger Mudd for 17 months before being named sole anchor of that program. For the first time, Good Morning America became the highest-rated morning news program in the United States as Today fell to second place. At the outset, Good Morning America was a talk program with a main host, Hartman, who was joined by a sidekick co-host; Dussault and Hill were scripted as less-than-equal hosts. In 1980, an exasperated Hill left Good Morning America after run-ins with Hartman, who was said to have "had a problem with strong women." She was replaced by Joan Lunden, then a reporter at ABC's New York City flagship station WABC-TV. Hartman and Lunden led the show through several years of success. Lunden's popularity led to her promotion to co-anchor in 1986, and to more equal footing with Hartman than any woman before her. The partnership ended on February 20, 1987, when Hartman retired after 3,189 broadcasts. After Hartman's departure, Lunden was paired with ABC News correspondent Charles Gibson on February 23, 1987, which ultimately resulted in ratings for the program skyrocketing. The team of Lunden and Gibson became the most popular news partnership on television in the late 1980s and early 1990s, and for the first time Good Morning America regularly won the ratings against Today. At one point prior to Spencer Christian's arrival in 1986, forecasts on the program were provided by WXYZ-TV chief meteorologist Jerry Hodak via a split screen between the WXYZ studios in Detroit and the Good Morning America set in New York City. Good Morning America entered the 1990s with continued overwhelming ratings success. Gibson and Lunden became a hard team to beat; however, the program stumbled from its top spot in late 1995, falling to second place behind Today (in what would begin a 16-year streak as the top-rated morning news program for that show, which began the week of December 11, 1995). Lunden began to discuss working less and mentioned to network executives that the morning schedule is the hardest in the business. ABC executives promised Lunden that a prime time program; Behind Closed Doors would premiere on the network in 1996. On September 5, 1997, Lunden decided to step down as host of Good Morning America after 17 years and was replaced by ABC News correspondent Lisa McRee. The pairing of Gibson and McRee fared well in the ratings. However, ratings sharply declined when Gibson also left the show to make way for Kevin Newman in 1998. With McRee and Newman as anchors, longtime viewers of Good Morning America switched to Today, whose ratings skyrocketed. To improve Good Morning America's ratings performance, which briefly fell to third place among the morning shows in January 1999, ABC News management selected Shelley Ross from the field of executive producer candidates. As part of Rossʼs proposed changes, Ross ousted the McRee-Newman team and lobbied to bring in Diane Sawyer and team her with Charles Gibson, who had been reluctant to return. On January 18, 1999, the Gibson-Sawyer team paired by Ross debuted on-air, which during the first full season resulted in a dramatic increase in viewership while all other network news franchises saw losses. The show moved from the ABC News headquarters in Manhattan's Lincoln Square district to its present home at the Times Square Studios on September 13, 1999. The new location made it possible for the program to feature a live audience inside the studio, similar to the "Window on the World" set used by Today. Under Ross, Good Morning America became a competitive 24/7 news operation with more exclusive bookings, news and live stock market updates for West Coast viewers and new on-screen graphics that included a news ticker. Good Morning America began originating entire shows from unique locations, which, according to Nielsen Media Research, resulted in more people watching the program and for longer periods of time. GMA became the first to originate a live show from an aircraft carrier during wartime (the U.S.S. Enterprise), from The White House (after the Columbine shootings), from The Pentagon (for the reopening of the wing damaged during the September 11 attacks in 2001), from The Vatican (for the 25th anniversary of John Paul II's appointment as Pope), and from the Tower of London (on the 50th anniversary of Queen Elizabethʼs accession to the throne). Viewership during this time increased by nearly 1 million households, and revenue soared. Although Today remained the top-rated morning news show, the Sawyer, Gibson and Ross team inched close, creating a viable rival. According to Linda McLoof, executive director of news research at ABC News from 2001 to 2009, "When Shelley left, her viewing momentum was initially sustained, but a season later, the audience began to decline. It is like passing the baton in a relay race." Antonio Mora served as newsreader for the program until March 18, 2002, when he left to become an anchor at CBS owned-and-operated station WBBM-TV in Chicago. He was replaced by former ESPN anchor and correspondent Robin Roberts. On May 23, 2005, ABC News announced that Robin Roberts would be promoted from newsreader to co-anchor of Good Morning America, joining Gibson and Sawyer. Roberts had previously served as a regular substitute for Gibson and Sawyer when either of them were on vacation or on assignment. On November 3, 2005, Good Morning America celebrated its 30th anniversary with retrospectives on and clips from the show's history and by decorating Times Square. Former co-hosts Hartman and Lunden, along with former meteorologist Spencer Christian, were among the guests of honor. Hartman signed off the show that day with his trademark close: "From all of us, make it a good day." That same day, Good Morning America became the first network morning news program to begin broadcasting in high definition. On December 2, 2005, weather anchor Tony Perkins left the program after six years. The last ten minutes of that day's edition were dedicated to Perkins, during which he gave thanks to one of the show's producers and a heartfelt goodbye to anchors Gibson, Roberts and Sawyer. Perkins left the program to return to his family in Washington, D.C. and join Foxowned-and-operated station WTTG, where he previously served as a weather anchor. He affectionately said to his young son on-air, "Connor, if you're watching, daddy's comin' home." Perkins was replaced by Mike Barz, former weekday morning sports anchor at WGN-TV in Chicago. Gibson left Good Morning America for the second time on June 28, 2006. That day's edition was dedicated to his 19 years as anchor of the program and celebrated his new role as anchor of ABC World News. Gibson ended his tenure at GMA by stating, "For nineteen years, my mornings have been not just good—they've been great." There had been speculation that Sawyer would leave Good Morning America when her contract expired in 2007 to assume the anchor position at ABC World News that was given to Gibson. In August 2006, Chris Cuomo was named news anchor while continuing his anchoring duties on the newsmagazine Primetime and serving as ABC News's senior legal correspondent. Meanwhile, Sam Champion, longtime evening meteorologist at WABC-TV, was named as the new weather anchor for the program and as weather editor for ABC News. Both Cuomo and Champion began their respective duties on the program on September 5, 2006, when Good Morning America instituted a new graphics package and new news area for Cuomo to report headlines. The following week, on September 13, 2006, the program introduced a new logo—this time with gold Avant Garde font on a blue background, which bears a resemblance to the original Good Morning America logo that was used up to early 1987. On June 29, 2007, the program's longtime film critic Joel Siegel died of complications from colon cancer at age 63. The July 9 edition of GMA was dedicated to Siegel, with former hosts Hartman, Hill, Lunden, Newman, Christian, Perkins and Gibson all appearing to share their memories. One month later, on July 31, 2007, Robin Roberts announced that she had been diagnosed with breast cancer after discovering a lump in her breast during a self-examination while preparing the Siegel tribute episode. Roberts remained as anchor while undergoing chemotherapy and completed radiation treatments on March 28, 2008. On October 22, 2007, Good Morning America introduced a new on-air graphics package. Using much of the design features of its former graphics, it went from a basic blue background to a more orangish-gold setting. The program's opening changed from the camera's zooming in on the hosts while introducing the host to an opening with new music (by the New York City-based music production company DreamArtists Studios) and a background with the Good Morning America logo descending onto the frame. It also changed its news ticker and time-and-temperature bug for the first time in years. The ticker featured an orange background with a modified ABC News logo as a breakpoint for each headline. The bug still featured the time and current local temperature to the left, but with an orange backdrop with an alternate "GMA" logo and the ABCNews.com logo to the right. On January 15, 2008, during an interview with Diane Sawyer on the program, actress Diane Keaton commented on Sawyer's physical attractiveness, stating that if she had lips like Sawyer's, "then I wouldn't have worked on my personality!" Keaton quickly apologized for the remark and Sawyer jokingly threatened to have her mother "work on your personality with soap in your mouth." Officials with the Federal Communications Commission declined to take action for the fleeting expletive. Following the death of Michael Jackson, Charles Gibson returned to the Good Morning America anchor desk with Roberts on June 26, 2009, while Sawyer was away. In September 2008, Good Morning America's anchors rode an Amtrak train to tour the United States as part of ABC News's "50 States in 50 Days" event, for which the program was broadcast from different locations around the U.S. each day throughout that month. The tour's first telecast stop was in Stockbridge, Massachusetts. On September 2, 2009, ABC announced that Sawyer would replace Gibson as anchor of ABC World News at the end of that year. Speculation had abounded that either George Stephanopoulos, news anchor Chris Cuomo, weekend anchor Bill Weir, or World News Saturday anchor David Muir would replace Sawyer on the program. Representatives for ABC News stated that it wanted to return the show to the original male-female anchor format. On December 10, 2009, Stephanopoulos was announced as Sawyer's replacement, with Juju Chang replacing Cuomo as newsreader; the changes took effect four days later on December 14. In April 2010, the anchor desk in the studio was relocated back in front of the window overlooking Times Square, where it had been when Good Morning America moved to the Times Square Studios facility in 1999; the news desk was also moved in front of a window. On May 3, 2010, the program debuted new "light blue and sunny" graphics, and new theme music by DreamArtists Studios. An entirely new set for the program was introduced on January 31, 2011; the monitor used for national weather segments (used mainly during the 7:00 a.m. hour only) was moved closer to the anchor desk while the news desk remained in the same place. This was the first major set change since the show upgraded to high definition in November 2005. On March 17, 2011, ABC News President Ben Sherwood announced that former GMA national correspondent Lara Spencer would be rejoining the program in a newly created lifestyle anchor position. On March 29, 2011, ESPN anchor Josh Elliott was named news anchor of the program following the departure of Juju Chang. In the summer of 2011, Good Morning America decided to vacate the second floor of the Times Square studios, which overlooked Times Square, due to cost issues. On September 6, 2011, the program began broadcasting from an entirely new studio set located on the first floor (ground level) of the Times Square studios. The "window" behind the presenters in the new set is a back-projection, although there are several real windows used in other parts of the set. Amid declining ratings at Today in the aftermath of reports of Matt Lauer's alleged role in Ann Curry's departure as co-host (though ratings had been in a steady decline for that program during Curry's co-hosting tenure), viewership for Good Morning America increased starting in 2012. The program beat Today for the first time in 16 years during the week of April 9, 2012, ending that program's streak of 852 consecutive weeks as the most-watched network morning news program, by a margin of 31,000 more viewers than the NBC program. Good Morning America beat Today once again during the week of April 16, 2012, by a much larger margin of 166,000 viewers. During the week of April 1, 2012, ABC News special correspondent Katie Couric, who had recently joined the network as part of a deal to host a syndicated talk show distributed by corporate sister Disney-ABC Domestic Television, filled for Robin Roberts on Good Morning America. Couric had hosted the rival NBC morning program Today from 1991 to 2006; her Good Morning America stint marked her return to morning news after six years. On August 30, 2012, Roberts went on medical leave after undergoing a bone marrow transplant (donated by her sister and fellow news anchor SallyAnn Roberts) following her diagnosis with myelodysplastic syndrome. GMA correspondent Amy Robach and 20/20 anchor Elizabeth Vargas served as the primary substitutes, typically alternating every other week. Others, including some celebrities, also served as special guest anchors during this time such as Kelly Ripa, Jessica Simpson, Barbara Walters and Elisabeth Hasselbeck. On January 14, 2013, Roberts announced that she hoped to return to the program sometime that February; Roberts performed dry run rehearsals during the week of January 21 in preparation for her return; she and her doctors evaluated her body's reaction to the makeup, the lighting, her hair, and the number of people she comes in contact with to avoid compromising her then-gradually-improving health. Roberts returned to Good Morning America part-time on February 20, 2013; she announced in August 2013 that she would return to full-time hosting duties on September 3 of that year. In 2013, GMA won its first May sweeps ratings period in 18 years. On December 4, 2013, weather anchor Sam Champion departed Good Morning America and ABC News after seven years on the program to join The Weather Channel, where he became primary anchor of the competing morning program America's Morning Headquarters (which debuted in March 2014). He was succeeded the following day by Ginger Zee, who had been serving as meteorologist for the weekend editions of GMA and was also appointed to Champion's former position as weather editor for ABC News. On March 30, 2014, news anchor Josh Elliott left ABC News after three years as news anchor of GMA to become a correspondent for NBC Sports, amid reports that contract negotiations to increase his annual salary (from $1.2 million to $8 million) broke down; Elliott was replaced as news anchor by Amy Robach later that week. The program continued to dominate over the competition, even with the loss of two major co-hosts in Champion and Elliott. In early April 2014, several media reports speculated that Michael Strahan would be joining GMA as a contributing anchor, while maintaining his co-host duties on Live! with Kelly and Michael (which is also syndicated by Disney–ABC Domestic Television). 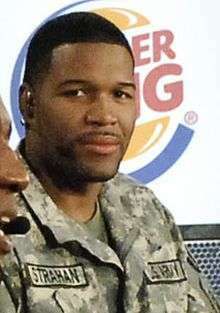 Strahan's new position was confirmed on April 15, 2014, when he was introduced to the audience as the new contributing anchor on the program. On April 18, 2014, Lara Spencer was promoted to co-anchor effective immediately, receiving top billing on the program alongside Roberts and Stephanopoulos. In September 2014, former NFL player Tim Tebow was announced to be joining the program as a part-time correspondent to help launch the new segment, "Motivate Me Mondays". He made his debut on the program on September 15, 2014. On November 19, 2015, the program celebrated its 40th anniversary, with all the main anchors and most of the news and weather anchors returning to join the celebration and share their stories. Clips from all 40 years were shown. On April 19, Strahan announced that he would be leaving Live! with Kelly and Michael to join Good Morning America full-time. On September 6, 2016, Michael Strahan began his run as official full-time co-host of the program along with Roberts, Stephanopoulos, and Spencer. A new title sequence was debuted. 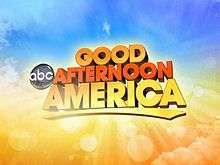 The title card for Good Afternoon America, which aired for a nine-week period. A special summer afternoon edition of Good Morning America, titled Good Afternoon America, premiered on July 9, 2012 as a temporary replacement for the canceled talk/lifestyle show The Revolution in the 2:00 p.m. Eastern Time weekday slot. Good Afternoon America was taped immediately after the morning program and focused on lighter fare, with the exception of the July 20 edition, which provided live coverage of the Aurora Century 16 theater shooting. Like its morning counterpart, Good Afternoon America originated from Times Square Studios. The limited-run program, which ended on September 7, 2012, was hosted by then Good Morning America news anchor Josh Elliott and lifestyle anchor Lara Spencer. The first weekend edition of Good Morning America premiered on January 3, 1993, airing only on Sundays; it was hosted at various points by Willow Bay, Aaron Brown, John Hockenberry, Dana King, Lisa McRee, Antonio Mora, Kevin Newman and Bill Ritter. The program was cancelled on February 28, 1999. In August 2010, Bill Weir left the weekend edition to become co-anchor of Nightline; Marysol Castro left the show the following month. While Dan Harris officially took over as Weir's replacement that October, meteorologists from various ABC affiliates across the country filled in to provide the national weather segments for over a year after Castro's departure; eventually in November 2011, Ginger Zee, who previously served as a meteorologist at NBC O&O WMAQ-TV in Chicago, was appointed as weather anchor for the weekend editions. After Zee was promoted to weather anchor of the weekday edition of Good Morning America in December 2013, the program returned to having ABC affiliate meteorologists to substitute on the Saturday and Sunday editions, until ABC announced the appointment of Rob Marciano (a former CNN meteorologist who had recently departed as co-host of Entertainment Tonight) as full-time weekend weather anchor in July 2014, effective that September. In July 2014, Bianna Golodryga announced she would be leaving ABC to take a correspondent role at Yahoo News. Paula Faris (who previously substituted for Golodryga in the spring of 2012, while she was on maternity leave) was named as Golodryga's replacement as weekend co-anchor. Most weeks, the GMA Weekend shows originate from the main ABC News set at the ABC Television Center in Manhattan's Lincoln Square neighborhood rather than Times Square Studios; the set's large rear-projection screen is used to project the Times Square background seen in the background of the weekday GMA to provide continuity. Previously the weekend edition of "GMA" was also aired from the Times Square Studio but was moved to the ABC News set to cut costs. On September 10, 2016, Sara Haines left the program as lifestyle anchor to take a full-time position as co-host of ABC's The View. In Australia, Nine Network broadcasts Good Morning America on its stations in metropolitan areas, and regional affiliates SC9 and NBN, on a one-day delay (by way of Australia and the United States being on different ends of the International Date Line) each Tuesday through Friday from 3.30 to 5:00, Saturdays from 4.30 to 6:00 and Monday mornings from 4:00 to 5:00 a.m. (Nine does not air the Saturday edition of the program). The Nine broadcasts features a map providing forecasts for Australia in place of national U.S. weather map (which itself is also, in a separate feature within the main weather segment, used as a cutaway to weather updates provided by local ABC affiliates). Although it airs at the same time as Seven Network and Network Ten's broadcasts of NBC's Today and CBS This Morning, Good Morning America's broadcasts by Nine is unchallenged ratings-wise in some regions where other affiliates preempt their networks' U.S. breakfast programs with paid and religious programming. OSN airs Good Morning America on OSN First HD live each weekday at 5:00 UAE / 4:00 KSA in the Middle East and North Africa Countries. In 1992 and 1993, Good Morning America won a Daytime Emmy Award for Outstanding Talk/Service Show. In 2010, the program was nominated for a GLAAD Media Award for "Outstanding TV Journalism Segment" for the segment "Total Transformation: Why Chaz Bono Decided to Change". ↑ Alyssa Bernstein (August 26, 2014). "Michael Corn Named Senior EP of GMA; Almin Karamehmedovic Named EP of World News". ABC News. Retrieved February 7, 2015. ↑ "GMA profile". Deadline.com. August 2013. Retrieved July 8, 2014. ↑ Staff (December 11, 2009). "Morning Show Ratings: 'Today' Makes It 14 Years at #1". TVNewser. Mediabistro.com. Retrieved September 15, 2012. ↑ Campbell Robertson (March 20, 2006). "Bill Beutel, 75, Dies; Longtime Anchor of 'Eyewitness News' in New York". The New York Times. ↑ WCVB-TV "Good Day!" Retrospective - 1989 - Part 1 of 2. 3 January 2009 – via YouTube. ↑ "The Evening News - Google News Archive Search". news.google.com. Retrieved 2015-10-07. 1 2 "David Hartman's Silent Partner No More, Joan Lunden Wins New Status on Good Morning America : People.com". www.people.com. Retrieved 2015-10-07. ↑ David Bauder (December 19, 2010). "NBC's 'Today' show streak hits 15 years". San Jose Mercury News. Retrieved February 18, 2011. ↑ Charles Gibson (June 28, 2006). "Charlie's Goodbye – An Emotional Tribute to Friends and Co-Workers". ABC News. Retrieved December 14, 2009. ↑ Brooks Boliek (January 16, 2008). "Diane Keaton Swears on TV, FCC Stammers". The Hollywood Reporter. Reuters. Retrieved December 14, 2009. ↑ "ABC News: Gibson Retiring, Sawyer Will Be Anchor". Yahoo! News. September 2, 2009. Archived from the original on September 9, 2009. ↑ Staff writer (December 10, 2009). ↑ "ABC Appoints Chris Cuomo To Be GMA Host". Google News. Associated Press. Retrieved December 14, 2009. ↑ "ABC News President Ben Sherwood announces the addition of Lara Spencer to Good Morning America as "Lifestyle Anchor"". TVNewser. Mediabistro.com. March 17, 2011. Retrieved June 27, 2011. ↑ "Juju Chang Out, Josh Elliott In at Good Morning America". TV Guide. Retrieved March 29, 2011. ↑ Chris Ariens (August 24, 2011). "New Director, Upgrades to Times Square Studio for 'Good Morning America'". TVNewser. Mediabistro.com. Retrieved September 15, 2012. ↑ "Musical chairs at 'Good Morning America'". NewscastStudio. September 6, 2011. Retrieved September 15, 2012. ↑ "'GMA' Weeklong Win Over 'Today' Confirmed; First Win in 16 Years". The Wrap. Chicago Tribune. Retrieved April 19, 2012. ↑ "'GMA' is #1 for Week of April 23rd by 166,000 Total Viewers–Takes 2 of Last 3 Weeks". TV by the Numbers. Zap2It/Tribune Media. April 30, 2012. Retrieved September 15, 2012. ↑ "Katie Couric Makes 'Good Morning America' Guest-Hosting Debut, Visits 'Dancing With the Stars' Set (Video)". The Hollywood Reporter. April 2, 2012. ↑ "'Good Morning America's' Robin Roberts to take medical leave for bone marrow transplant". Fox News. Associated Press. July 27, 2012. ↑ "With Roberts Back, 'Good Morning America' Looks to Widen Ratings Gap Over 'Today'". The New York Times. February 20, 2013. ↑ "Robin Roberts Plans to Return Full Time to 'Good Morning America'". The New York Times. August 29, 2013. ↑ "Morning Show Ratings: Week of May 20 and May Sweeps". TVNewser. Retrieved May 31, 2013. ↑ "Sam Champion exits ABC for Weather Channel". CNNMoney.com. December 2, 2013. ↑ "Sam Champion Reveals Name of New Weather Channel Show". The Hollywood Reporter. January 31, 2014. ↑ "Sam Champion Leaving ABC for The Weather Channel". TVNewser. December 2, 2013. ↑ "ABC's Josh Elliott leaving 'Good Morning America' for NBC Sports". CNNMoney.com. March 30, 2014. ↑ "'Good Morning America' shake-up: Amy Robach succeeds Josh Elliott". The Washington Post. March 30, 2014. ↑ Jordan Charlton (April 18, 2014). "Lara Spencer Named Co-Host of 'Good Morning America'". TVNewser. Retrieved July 5, 2014. ↑ Lyneka Little (September 12, 2014). "Tim Tebow Signs On With 'Good Morning America'". The Wall Street Journal. Retrieved September 14, 2014. ↑ Alex Block (April 12, 2012). "'Good Morning America' Afternoon Spinoff Might Tap Different Hosts". The Hollywood Reporter. Retrieved April 12, 2012. ↑ The Deadline Team (May 21, 2012). "ABC Names Josh Elliott And Lara Spencer To Host 'Good Afternoon America' Run". Deadline Hollywood. Retrieved May 21, 2012. ↑ "Mike Barz". kdvr.com. Retrieved 24 November 2015. ↑ "ABC News Hires Two Anchors from NBC Station in Chicago". TVNewser. November 2011. Retrieved July 8, 2014. ↑ Alyssa Bernstein (July 18, 2014). "Rob Marciano Joins ABC News as Senior Meteorologist". ABC News (Press release). ↑ Jordan Chariton (July 18, 2014). "Bianna Golodryga Leaving 'GMA' for Yahoo! ; Paula Faris Promoted to Co-Anchor". TVNewser. ↑ "21st Annual GLAAD Media Awards – English Language Nominees". Gay & Lesbian Alliance Against Defamation. 2010. Retrieved February 21, 2010.